S2U2 v2.33 freeware for Windows Mobile Phone. Summary: S2U2 is a simple lock/unlock application which has the iPhone style slide unlocking. * If you have Slide2Unlock installed, please uninstall it first & then soft-reset. * Under your PC/MAC/device, extract the content of the downloaded file & copy the CAB file to your device. 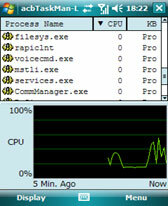 * Under your device, run any File Explorer application; go to the folder where the CAB file is copied; run the CAB file. - iLock2.lnk: start/stop ilock2.exe (on the 1st run, it runs silently in the background; on the 2nd run, it closes iLock2 & S2U2). - s2u2.lnk: manually start S2U2 (be sure iLock2 is running in the background, otherwise the Battery status will not be updated). - s2u2 Settings.lnk - change the settings of S2U2. * A shortcut for iLock2.exe is created automatically under "\Windows\StartUp" as well. * If it's your first time to use S2U2, please start iLock2 first. * For hi-res devices, d/l the S2U2ClockPack.rar & follow the steps in the ClockReadme.txt. Otherwise the clock will be shown as half-sized. * For additional clock fonts, d/l the S2U2ClockPack.rar & follow the steps in the ClockReadme.txt. * For non-English devices, d/l the S2U2LanguagePack.rar; extract your language's ini file; rename it to lang.ini; copy to the S2U2 installed folder; restart iLock2. - Language Pack (Afrikaans, Arabic, Chinese (Simplified & Traditional), Czech, Danish, Dutch, French, FYROM, German, Greek, Hebrew, Hungarian, Indonesian, Italian, Japanese, Korean, Norwegian, Polish, Portuguese, Portuguese BR, Romanian, Russian, Slovak, Slovenian, Spanish, Swedish & Turkish) Most of them are still not completed yet. Read the LangReadme.txt for the changes. Please let me know if you can complete them. - changed the �slide to dismiss/cancel� option to the right-hand-side of the slider so as to synchronize with the OS. 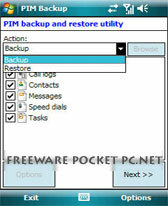 - added option to lock all message/notification/task preview when �Lock System Notification� is on (S2U2 Settings > General). - added option to auto snooze an active alarm when power off (S2U2 Settings > General). - added �slide to snooze� when an alarm/reminder is shown on the lock screen (�Lock System Notification� must be on). - added option to shuffle the password keypad (S2U2 Settings > Password). 1) when the device is locked, turn the device off if the proximity sensor is blocked (S2U2 Settings > Power). 2) when the device wakes up, unlock the device if the proximity sensor is not blocked (S2U2 Settings > Power). * the auto lock/unlock will be temporarily disabled if there is a message prompt (e.g. Alarm/SMS) shown on the lock screen. - added option to show current weather info if weather info is shown from Pocket Weather / TouchFLO 2D / TouchFLO 3D (S2U2 Settings > Information). If you want to know why other weather applications are not supported yet, read the FAQ. - added option to cache each frame of a GIF wallpaper by device memory (S2U2 Settings > Wallpaper). This option reduces the memory usage of S2U2 when uses a GIF wallpaper; it loads faster & capable to load very large GIF file (depends on how many free device main memory is left). But it also consumes the device main memory; lesser smooth animation; & definitely consumes more battery. - added option to toggle the system volume (�slide to ringer/vibrate�) when the slider is positioned at center (S2U2 Settings > Appearance). - added option to change the sliding text size (S2U2 Settings > Appearance). - added option to lock/unlock when the device is connected to a cradle (S2U2 Settings > Others). 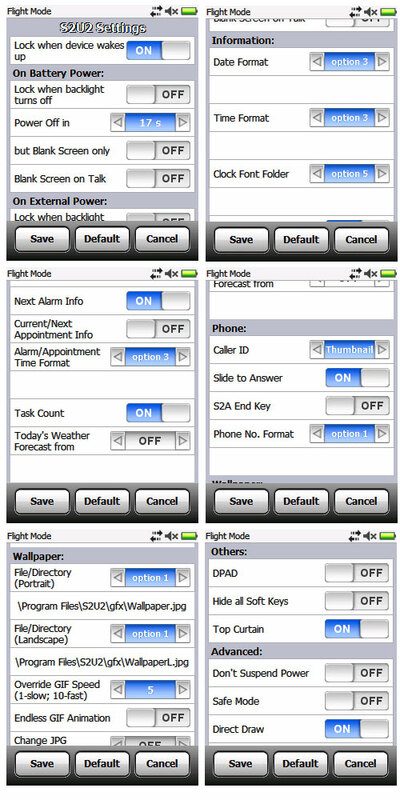 - added option to not to lock the HTC long End key press (S2U2 Settings > Advanced). S2P, TouchFLO 2D/3D Music Player, Windows Media Player, MortPlayer, Pocket Music, Pocket Player & Nitrogen. So if you suspect S2U2 is draining the power, check if a music icon is shown on the top system bar. When either one of these music applications is running, S2U2 will not turn off the power, but only turn off the screen. - fixed an occasional battery drain on some devices. - fixed the Answer key was not locked on HTC HD2 even when "slide to answer" was active. - fixed an occasional issue that S2P was invoked during BT file transfer. - renamed "InCall Lock" to "Lock on Talk"; additional option for using external power; and moved to S2U2 Settings -> Power. - added option - "Don't lock system"; when it's on, the system will behave the same as the old version. (S2U2 Settings -> Advanced) since v2.20, when S2U2 locks the system, the system will behave as it's locked by the system built-in lock. however, on some devices, it may lead to some not-welcome behaviour when locked: for eg, on Omnia/Omnia II, the backlight will be dimmed; on some devices, unlock will always go to the home screen. but there is a draw back when this option is turned on: some keys or system functions can be activated even it's locked. - added to show the divert call status on the lock screen. - removed the option "lock the device after any phone call when Bluetooth is on". - added option "InCall Lock" (S2U2 Settings -> General) either don't lock the device during a phone call; always lock; or only when Bluetooth is on. if CallerID is enabled, connected time of the call will be shown on the lock screen. - fixed an occasional issue that Dotfred's TaskMgr would hang when running S2U2 since v2.x. - fixed the small volume bar of the VGA/WVGA S2P control plugin. - fine tuned the CallerID and S2U2 Settings for HTC Pro2 & HD2. - changed the Volume Control layout so that Volume Up/Down keys can toggle between normal, silent and vibrate.- added support to "Simple Mode" volume control on some new HTC devices. - added support to "My Location" weather with TouchFLO 3D v2.5. - improved compatibility with WM6.5 devices, especially the CallerID. but it's not recommended to use the CallerID together with the WM built-in lock. - fixed an occasional power leak when the device is sleeping. - fixed the error in v2.10 when GIF wallpaper is used together with "Battery on top" turned on. - fixed the CallerID problem that if your device works with v2.0x but not with v2.10. - fixed an occasional power leak that new message is received when the device is sleeping. - fixed the occasional problem that the taskbar is distorted when unlock. - "Curtain Opacity" now works with "Float" top curtain. - improved compatibility with WM6.5 devices, especially the CallerID. - added Lithuanian language support. - further enhanced S2U2 Settings to edit the Exceptional EXEs list; change the run application after unlock; and change "Language" (must download the language pack & copy it to S2U2's installed folder first). - added to show Caller/Sender pics on the missed call/message pop-up. - added to show account name on the email pop-up. - added a new set of graphic files for showing the full-screen battery - battery0.png, battery10.png... battery100.png. download the S2U2BatteryPack-QVGA.zip or S2U2BatteryPack-VGA.zip & refer to the BatteryReadme.txt inside for details. - added option to show "Full Screen Battery on top of wallpaper". - added Mouse lock for Omnia. - added option to show S2P current album pic or not. - re-added option GDI to "Display Mode" with faster performance. 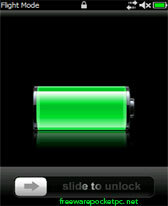 - moved the option "Lock when Screen is Blank" to Power section to cater on battery and external power situations. - extended the limit of "Boot up Delay" to 60s. - fixed the corrupted screen on Touch Pro 2 when the orientation is changed, "Display Mode" have to be set to GDI. - fixed the mis-shown of Bluetooth icon on Touch Pro 2. - improved compatibility with WM6.5 devices, especially the CallerID. - a few minor bugs fixed. - changed option "Auto-dismiss Notification" to "Dismiss a Notification once it�s been viewed". - fixed �Country/Region Code� could not be more than 255. - fixed the CallerID did not work on some devices (e.g. Spainish) but used to work in v1.6x. - fixed SMS/email pop-up ocassionally not the same as the one opened when �slide to view�. - Fixed when CallerID was off, system might hang after receiving an incoming call. o New user interface; subgrouping levels. o Change/browse the wallpaper or wallpaper folder; on-screen zooming/cropping. o Change/browse the lock/unlock sound (MP3 is supported for WM6 or later devices). o Added sleep timer for S2P. o Show the latest 5 missed call details (press & hold the missed call icon). 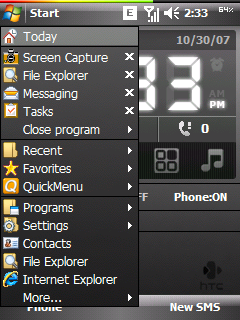 o show the latest 5 active task details (press & hold the active task icon). o directly go to that unread email/SMS (shown on a pop-up) when unlock. o to dismiss a pop-up, either tap the pop-up or the corresponding notification icon. - Added emergency call function when password is enabled. - Added options to show text shadow effect. o Only tested on the WM6.5 emulator. o When the system lock is activated, S2U2's CallerID will be temporarily disabled. - Increased the exception EXE list to 20 entries & moved to \HKEY_CURRENT_USER\Software\A_C\S2U2\Exceptions. rip off! you cant delete it! my htc 2 now has 2 lock screens. i have a htchd2 how do you change the wallpaper ? Damn.... There's too many Instructions to Set this on my HD2. Too many Settings for this one..... Dont Like it cuz of this.... Try to make it Easy...... -RO Monroe. Very Nice app.. Work perfectly on my Acer..
how have i lived without it. this programmer took the time and had the knowledge to make this program really work and work well. thanks and keep up the great work. You can't get the orginal lock back :( crap!